John Deere 5R Series Tractors have received the American Society of Agricultural and Biological Engineers' (ASABE) AE50 Award for 2018. The AE50 Award recognizes innovative designs in product engineering as selected by a panel of international engineering experts. Introduced in 2017, 5R Series Tractors leverage existing technologies normally found in large tractors and feature four models ranging from 90- to 125-engine horsepower. "John Deere engineers designed tractor features to provide customers with unrivaled maneuverability, an easy-to-use transmission, increased visibility, loader integration and operator comfort," said Nick Weinrich, product marketing manager for Deere. A 7.4-foot (2.25 m) wheelbase, paired with a 60-degree steering angle, provides a tight turning radius of 12.1 feet (3.68 m). "For customers working in confined areas such as barns, this is a big improvement because they can more easily maneuver the tractor while increasing their productivity," said Weinrich. Customers can choose from two fully electronic transmission options, CommandQuad™ Manual and Command8™. Weinrich said Deere made it easy for operators to toggle from B range through D range without stopping, thanks to a multi-range selection feature. Base equipment on 5R Tractors also includes AutoClutch™, a feature leveraged from larger Deere row-crop tractors that completely eliminates the need for clutching. Operators can automatically re-engage the clutch by depressing the brake pedal. 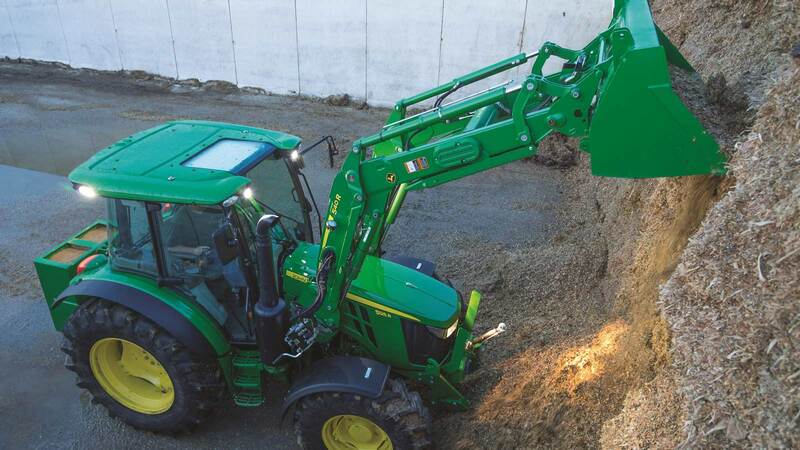 Deere engineers improved upward and forward visibility from the tractor to help make 5R Series Tractors an even better fit for loader applications. Engineers also integrated an interactive display into the tractor's right hand cornerpost. Operators can use the display to customize a variety of tractor functions to fit their preferences.